Ocean Grown Abalone CEO Brad Adams addressed the room to explain how his abalone farm operates. “We have the perfect environment and habitat for abalone to grow at our ocean farm in Augusta – the water is clean, between sixteen and twenty-two degrees, and there’s lot of algae in the seagrass beds for the abalone to feed on,” Mr Adams said. 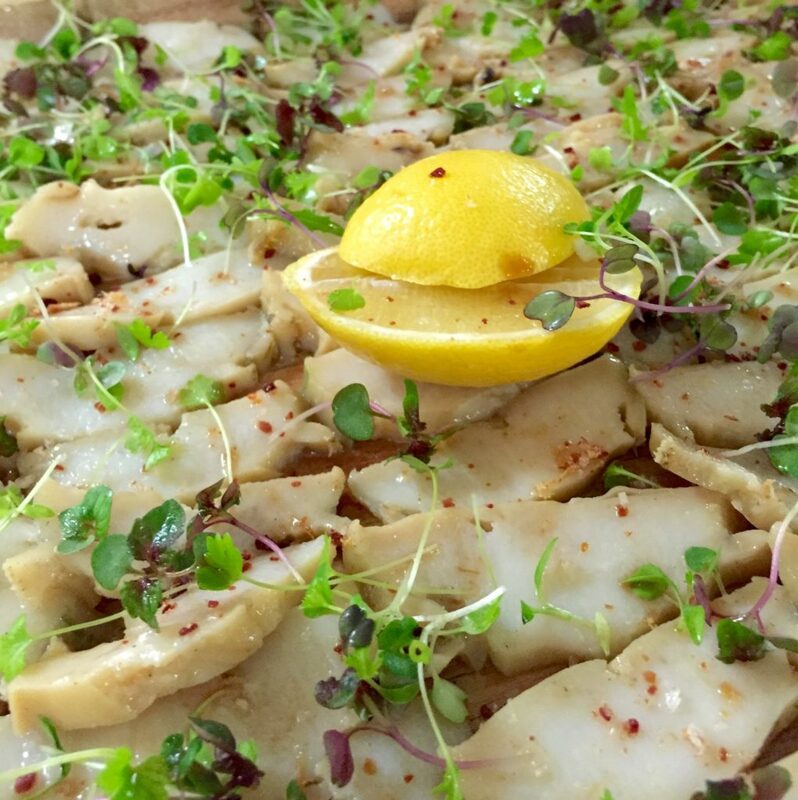 The sliced ceviche abalone was served with jamon salt; it has a unique meaty texture and ocean enhanced flavours. Currently producing 30 tonnes of abalone per year, Mr Adams said that in three years he expects them to be one of the biggest abalone producers in Australia with a projected annual output of 100 tonnes. 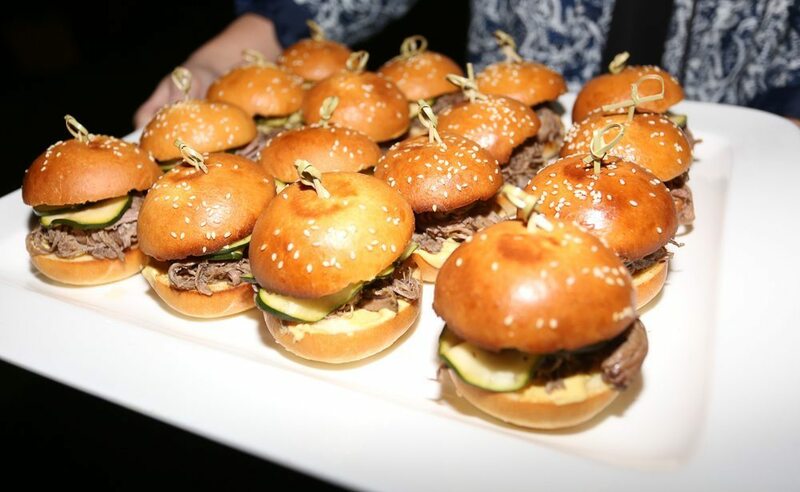 The Arkady lamb sliders with zucchini pickle and mustard flew off trays as soon as staffed stepped out of the service area. Tom Hayward from Farm House Margaret River said that the British breeds of lamb, Suffolk and Dorset, were hormone free and grass fed to produce top quality meat. Luke Clayton from Garden Basket produce spoke about the heirloom carrots and beetroot and how he works closely with farmers in the south west corridor to ensure he gets the best produce for his customers, which include acclaimed restaurants at Aravina Estate, Wills Domain, Vasse Felix and Leeuwin Estate. The Panko breaded nannygai fish served with sushi rice and kewpie was crisp and succulent, and proved to be popular with the health-conscious guests. Grae Vitnell from 34 Degrees Blue explained that the nannygai fish was line caught from a boat off the coast of Gracetown. 34 Degrees Blue has a small retail shop in Margaret River’s light industrial area where they also supply primarily prawns and scallops. Guests enjoyed local wines from Howard Park, Mad Fish, and Aravina Estate. Mr Lane said that it was fantastic to see everyone enjoying themselves and talking about the food they were eating. “This is just another way we are connecting local businesses with Drug Aware Margaret River Pro – it’s a win-win for all involved,” Mr Lane said.